"A classic design with elegant detailing along the edges." "The bright-white construction is simple and cheerful." "Integrates four charging ports directly into the tabletop so you can conveniently charge your devices while you sleep." "Integrates a small safe that you access from the back of the cabinet, with the key code accessible from the side of the cabinet." "Has a small drawer for personal items, and the shelves can be left empty or used as storage or display space." "Boasts three medium-sized drawers but is still lifted up on feet so it doesn’t have the bulky look of some storage nightstands." "Has plenty of storage that your child can easily access, and the versatile white can add a friendly, bright vibe to the room." "Offers a white lacquered top and oak base for a stylish mid-century look." For most people, the best nightstand will have a pleasant, transitional design that works in many spaces. The standard nightstand style includes one or two smaller drawers at the top to hold personal items, with either a shelf below for additional storage. Some just have legs underneath for an airier look. On the nightstand top, you need just enough space to hold a small table lamp and perhaps a book or phone, so you don’t really need too much surface area! The Beachcrest Home Winfield End Table has all of that, including a classic design with elegant detailing along the edges. The light-gray finish is a versatile color that will work with many design schemes, though it is available in eight colors. You're sure to enjoy this one because more than 2,000 customers have given it a positive review on Wayfair. If you’re furnishing a guest room, rental, or dorm room, you may not want to spend a lot of money on a nightstand. Even if it’s for a master bedroom, if you’re decorating on a budget, you may prefer to spend more on bigger-ticket items like a mattress or comforter, instead. There are a few ways to stay on price without sacrificing style. You can look for a nightstand made of a less expensive material, like metal or MDF with a wood veneer, instead of solid wood. Choosing a nightstand with fewer bells and whistles will save you money as well. And, if you assemble the nightstand yourself, that can make it even more affordable. While most nightstands can run you $100 or more, the Lifewit 2-tier Nightstand comes in under $50 for a real bargain. The bright-white construction is simple and cheerful. If you like to plug in your phone at night or to read on a tablet, it makes sense to have these items plugged in right next to your bed. But that can lead to a tangle of messy-looking cords cluttering up an area that should be calming and peaceful (not a source of stress!). Fortunately, furniture makers have come up with a solution: Integrating either a USB charging port or an old-fashioned electrical plug right into the nightstand. Often, these charging ports are integrated into the drawer of a nightstand, but sometimes you’ll find them in the back or side of the piece. The Casual Home Night Owl Nightstand integrates four charging ports directly into the tabletop so you can conveniently charge your devices while you sleep, with fewer messy cords. It comes in a warm brown and espresso finish. If you are concerned about intruders in your home, a smart place to store your most valuable items can be in a safe right next to your bed. And if you own a firearm, a nightstand with an integrated safe can offer a discreet, secure, and child-proof place to store a gun. It will be within easy reach, should you ever need it for defense. Nightstands with added security come in a couple varieties. You can look for one with a locking drawer or a slide-open top that can accommodate a stand-alone gun safe. Or, you can find a nightstand with the safe already integrated into the design. A nightstand with a safe is typically more expensive than a basic nightstand because of the additional mechanisms required to make it secure. The Man Tables Home Defense Nightstand integrates a small safe that you access from the back of the cabinet, with the key code accessible from the side of the cabinet. In a tight space, finding a nightstand that will work in a small footprint and not crowd the room can be challenging! 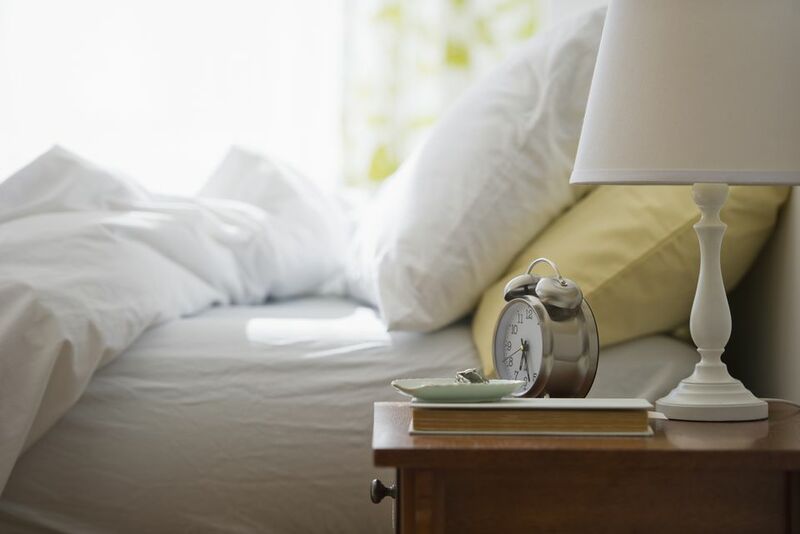 While it may be tempting to buy a nightstand that offers as much storage as you can find, resist the urge to get a bulky piece of furniture. Adding a too-large piece of furniture on one or both sides of the bed can make a small room feel crowded. That is definitely not the relaxing vibe you want when you’re settling in for the night. Instead, opt for a smaller-scale nightstand with open legs or shelves instead of closed drawers or a cabinet. It will have that open space that makes the room feel airier and more relaxing. The Elegant Home Fashions Dawson Cabinet has one of the smallest footprints available, at just 11 by 15 inches at the base, but it's nice and tall at 28 inches. It still has a small drawer for personal items, and the shelves can be left empty or used as storage or display space. If you’re looking to add storage to your bedroom, a nightstand can be a good spot to file papers, stash books, or even act as an extra dresser drawer for items like t-shirts or underwear. Let's be honest—any tool you can use to keep the bedroom tidy will help you relax at night!. If you’re looking for a nightstand with storage, consider a two- or three-drawer option. The Lignite 3-Drawer Nightstand boasts three medium-sized drawers but is still lifted up on feet so it doesn’t have the bulky look of some storage nightstands. It’s available in 10 colors including black, white, and various wood stains. In a kids room, having your child’s favorite bedtime books within arm's reach can make bedtime a little easier. Adding a little storage to the nightstand can be a boon for a kids’ room. Open bin storage is especially kid-friendly, because even young children can help tidy up. The Sauder Pogo Nightstand is a perfect option. 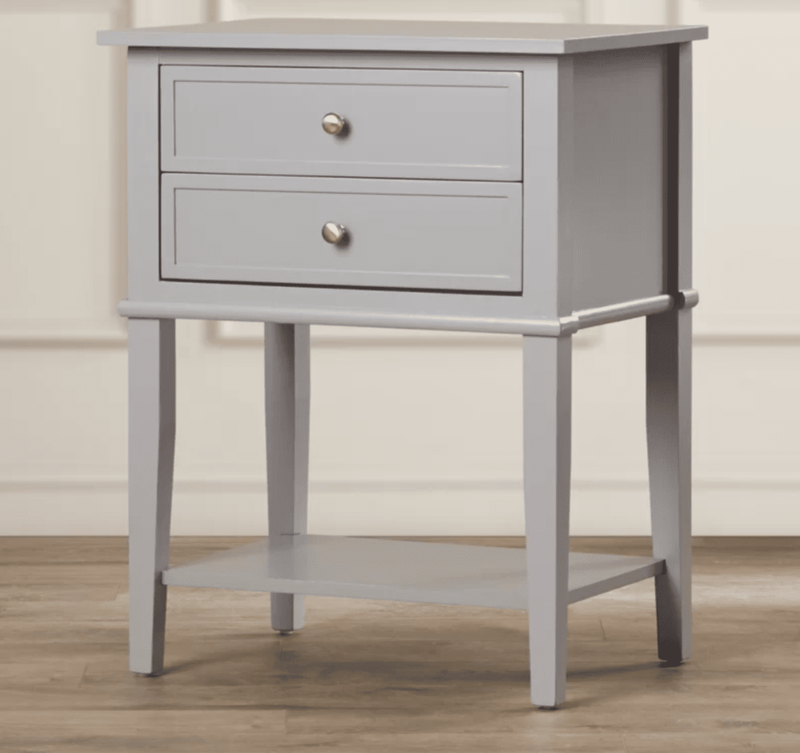 This wide nightstand has plenty of storage that your child can easily access, and the versatile white can add a friendly, bright vibe to the room. The bin is perfect for a few books or stuffed animals that your child wants to keep right next to them at nighttime. Mid-century modern designs have come back into fashion and can be found all over the decorating space. In the bedroom, a mid-century modern nightstand can set a cool tone for the rest of the room. This style can make a simple headboard feel more stylish or can give an old-fashioned bedroom a modern spin. The hallmarks of mid-century modern nightstands include a squat upper drawer and skinny, sometimes splayed-out legs. You can find these nightstands made of wood or wood-look material, sometimes with metal accents integrated into the design. The eHomeProducts two-tome version offers a white lacquered top and oak base for a stylish mid-century look. Because it’s made of MDF instead of solid wood, it’s much less expensive than similar-looking nightstands from other retailers.